SEOUL, Sept. 6 (Yonhap) — U.S. President Donald Trump thanked North Korean leader Kim Jong-un and pledged to work together with him on Thursday after Kim said via a South Korean envoy that his faith in Trump remains unchanged. 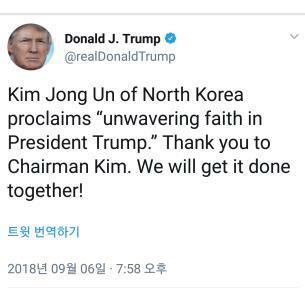 “Kim Jong Un of North Korea proclaims ‘unwavering faith in President Trump.’ Thank you to Chairman Kim. We will get it done together!” Trump tweeted. South Korea’s chief presidential security adviser, Chung Eui-yong, made a one-day trip to Pyongyang on Wednesday and held talks with the North’s leader amid a deadlock in denuclearization negotiations between the United States and the North. During the talks, Kim told Chung’s delegation that he remains firmly committed to denuclearization and that his faith in Trump remains unchanged, even though nuclear negotiations with the U.S. encountered difficulties, according to Chung. Kim was also quoted as saying he’s never spoken ill of Trump to anybody.